It looks as if Henry Moore's "Old Flo"might finally be returning to the East End of London - and my home borough of Tower Hamlets. That would also mean one of the oddest stories about ownership of a key piece of sculpture might also be drawing to a close. 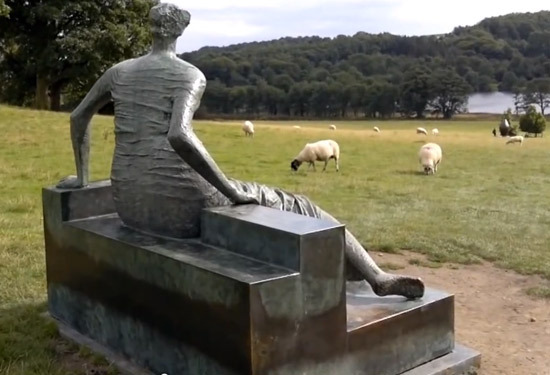 "Old Flo" - Draped Seated Woman as she is formally known - has sat quietly in the Yorkshire Sculpture Park while various parties have lobbied on her behalf. Henry Moore Sculpture - a very poor precedent Nov 8, 2012 This relates the story the creation of Old Flo; her relationship with the borough and the story behind the then Mayor's proposal to sell the sculpture sell the sculpture. I cited six reasons why this was a really bad idea in relation to public ownership of art by famous artists - and this work in particular. It's worth noting that Lutfur Rahman is now the ex-Mayor of Tower Hamlets after being discredited in the High Court and expelled from office - followed by personal bankruptcy and a further Court Case which indicates he and his wife lied to the Court about his assets. 1963 - LCC abolished and its functions transferred to the Great London Council (GLC) and the local borough. The land and buildings comprising the Stifford Estate in Stepney were transferred to the new Tower Hamlets Council - which incorporated the former Stepney Borough Council. 1985 - GLC Dissolved. The sculpture was not listed in the 1963 Order, and so remained the property of the GLC until its dissolution in 1985. 1996 - all the remaining assets of the GLC transferred to the LB Bromley as the residuary body. October 2012 - Mayor Rahman announced the proposed sale of Old Flo would be put up for sale by auction. Subsequently he confirmed his decision to sell the sculpture without paying any attention to the representations of the Overview and Scrutiny Committee or any of the other representations made on this matter. November 2012 - the protest began. The campaign to keep Old Flo from being auctioned off (as an item of public art) was active and vociferous. 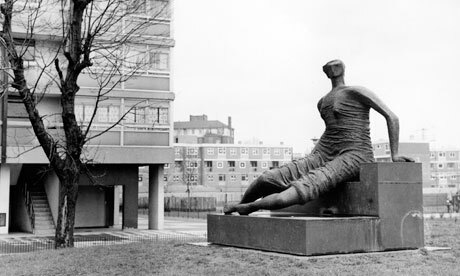 3,000 people signed a petition to Save Old Flo and to keep the sculpture in Tower Hamlets. December 2012 - London Borough of Bromley wrote to Tower Hamlets Council to assert ownership of Old Flo and applied for an injunction to stop the sale. April 2015 - Lutfur Rahman found personally guilty and guilty by his agents of corrupt and illegal practices. He was banned from holding public office for five years by the Electoral Court. New election ordered. June 2015 - John Biggs was elected as the New Mayor following the former Mayor being disbarred from public office. It very soon became clear that a sale would not be pursued. July 2015 - In Tower Hamlets LBC v Bromley LBC  EWHC 1954 (Ch), the High Court confirmed LB Tower Hamlets as the legal owners of the sculpture. Subsequently LB Bromley mounted an appeal of that decision. 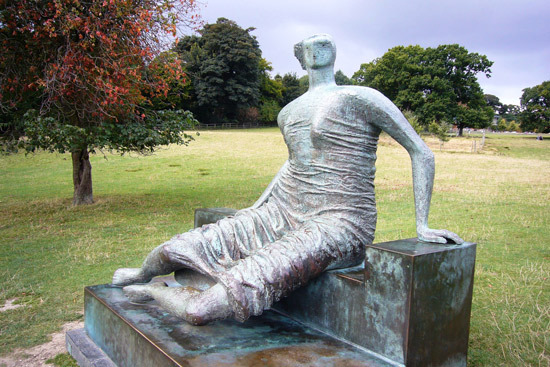 19 May 2016 - The Appeal Court rejected Bromley's appeal and Tower Hamlets Council has been reconfirmed as the legal owner of the Henry Moore sculpture Draped Seated Woman. just how unaccountable elected Mayors are compared to the previous arrangements for running local authorities. how fundamentally poor the current system is at rooting out those who are in politics for their own ends - and not for the wider public good. how vulnerable public art is to being sold for funds to run the Council - particularly when the man in charge falls way short of the standards that we ought to be able to expect of those in public office. Public Art needs to be protected from the asset strippers! At the end of the day the only thing that saved Old Flo from sale was the vagaries of documentation relating to the transfer of assets and residuary functions when the GLC was dismantled. It's just taken three and half years to resolve the question of ownership. If the paperwork had been in order at the outset, Old Flo would have left public ownership at an Auction at Christies in February 2013! The Mayor of LB Tower Hamlets now needs to find a location where Old Flo can be located safely and securely and enjoyed by the population of Tower Hamlets as a whole. In terms of safety, there's probably no question that the safest place which is accessible to the population of Tower Hamlets is probably what is now the private estate at Canary Wharf. It has its own security force which is active and vigilant. Nowhere else in the borough - with the possible exception of the Tower of London enjoys the same degree of security. However the problem with Canary Wharf is it probably does not meet Moore's wishes. Moore, a well-known socialist, sold the sculpture at below market value on the understanding that it would be displayed in a public space and might enrich the lives of those living in a socially deprived area. The sculpture should placed in the moat surrounding the Tower of London. It can then be seen by everybody and is completely safe from vandals. Plus nobody is going to be lifting a bronze sculpture out of that location in a hurry or without being noticed as it would need a crane! Now all somebody has to do is persuade the Tower of London that the moat has a future as a sculpture garden! Below are newspapers and journals reporting on the continuing story of Old Flo.